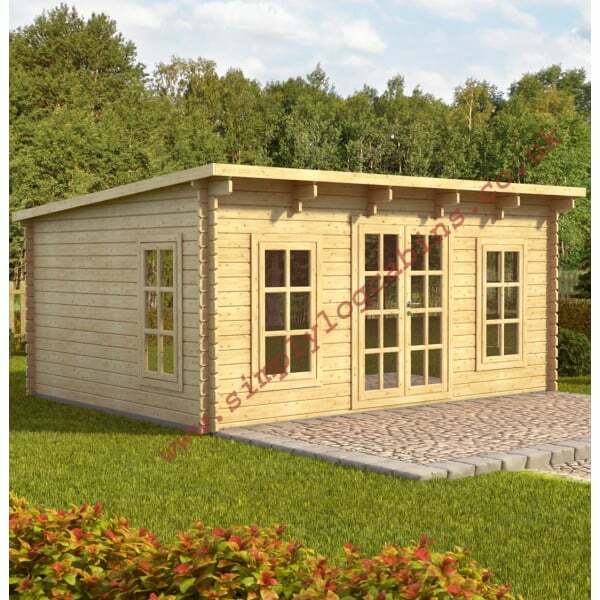 Eurovudas Torino Log Cabin: The Eurovudas Torino features 4 x Large Single Windows and a Large Double Door. This building for locating at the back or side of the garden, it creates a light and airy environment inside the building with its 4 windows and its unobtrusive design with the low pitch of the roof. The design incorporates a 2.16m high back wall which allows plenty of headroom but with its pent roof maintains a modest overall profile within the garden. simply ideal for use as a garden office, a hobby room or simply a leisure room in the garden then the Torino provides an ideal and attractive solution. The sturdy roof structure along with the premium quality North European Spruce that is used in the construction means that you are buying a building with a very long life expectancy given that it is stood on a firm level base and the timber is treated correctly.